Keeping up with your child’s wardrobe is a big job! They grow so fast and need so many things. A great way to keep the costs down is selling things that no longer fit or went unused. 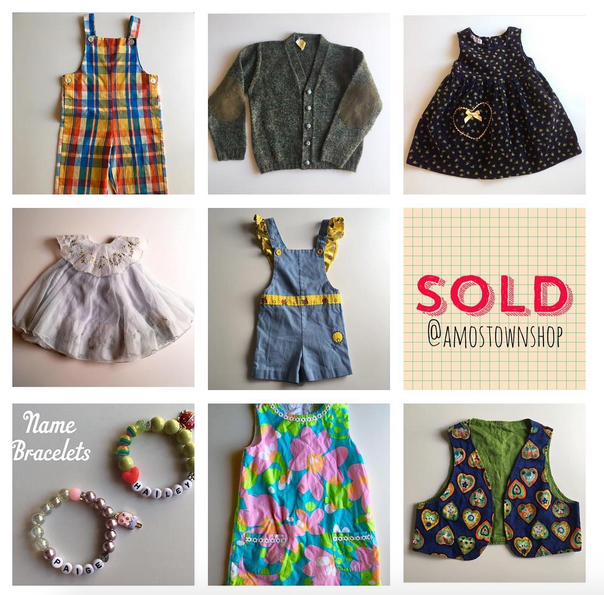 There are myriad options for selling kids’ clothes these days: resale shops, yard sales, virtual yard sales (like Facebook Buy, Sell, Trade groups), online companies like ThredUp and Kidizen, and then there’s Instagram, where I sell at @amostownshop. 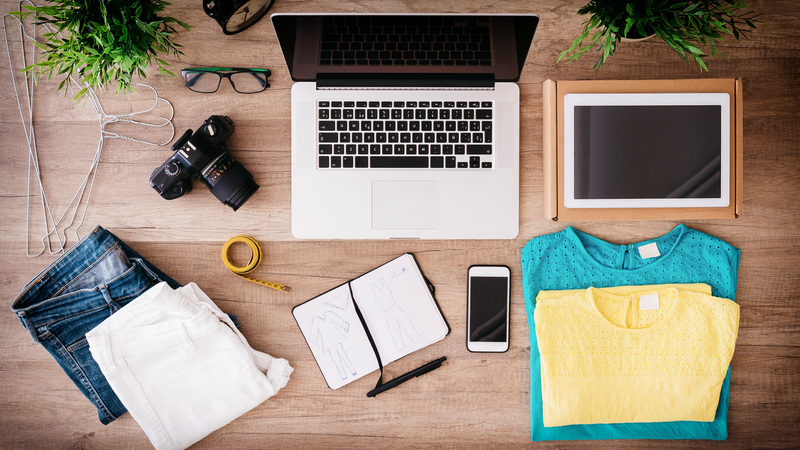 Let’s go over the basics of Instagram commerce! First, you need to know how to buy. This is the fun part! Start by finding a shop you like. A good way to do this is to ask friends for recommendations or search hashtags like #kidsresale or #vintagebaby. If you like a specific brand, try that — e.g. #babygapforsale. Keep scrolling until you see something you like. You want to make sure that you won’t get scammed. Do they have a “feedback” post? If so, see what customers are saying. Do they introduce themselves anywhere? Do their photos look consistent and not like screenshots from other places? Make sure the shop invoices their customers via PayPal; don’t send money via “friends and family,” as you’re not protected in case there’s a problem. Once you’ve vetted the shop, check their instructions for how to buy. To keep track of my purchases, I have a special “purchases” post where I note in the comments what I ordered and from what shop. That way, I know if I’m receiving all my items. Also, other shoppers can check out what shops I frequent. I like vintage, so some of my favorites include @jandmcloset, @floralsandfunk, and @pennysclosetxo. If you’d like to start your own shop, familiarize yourself more deeply with the accounts you admire. Look at their policies to get an idea of how you’d formulate your own: shipping time, refunds, how you’d like people to purchase, whether you allow backups, etc. Make this clear in your bio and/or policy post, because awkward situations can occur. Once I had customers fight over a $12 used Baby Gap dress because of confusion over who claimed it. People can get crazy over baby clothes. But overall, I’ve had positive experiences selling. I sell vintage and modern, but you can specialize in just your own kids’ clothes, only modern, only handmade, only vintage, what have you. “Curating” your store is part of the fun! 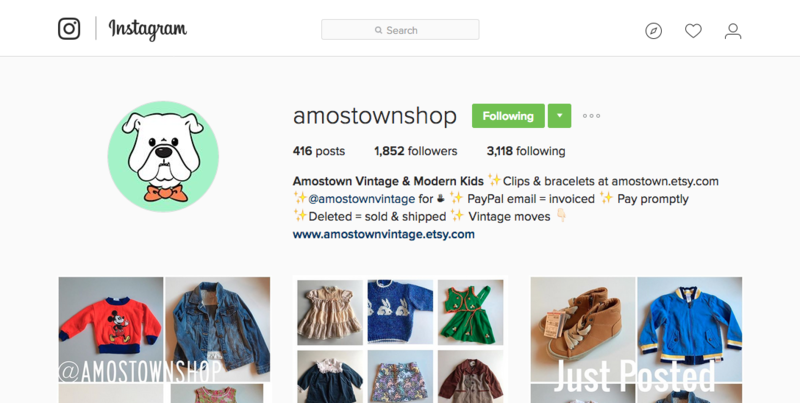 My shop name is @amostownshop because we joke that my English bulldog, Amos, is the mayor of Amostown. I included “shop” just so people are clear that it’s a selling account. Get creative with your shop name. Some names I like: @brightchildvintage, @ellasmoonshop, @penelopieces. Then post your policies, an “introduction” photo with a bit about yourself, maybe a feedback post, a “tag list” where people can sign up to be alerted for sales and any other posts you think are beneficial. You could do a “shop by size” post with your size hashtags, a purchases post, etc. Now comes the tricky part: gaining followers. There is no right way to do this, but beware that Instagram will shut you down if you follow too many people at once or post too much within one day, assuming that you’re a spambot. (This happened to me when I first started and I lost all my “work,” plus I had to choose a new name.) So go slowly and interact with other shops and shoppers. Like items you actually enjoy, comment and ask questions too. The most important thing you can do, in my opinion, is the “shop share.” This is when you share an item on your account and the other shop returns the favor and ideally customers cross-pollinate! Look for posts titled “shop share.” Leave a comment that you’re interested. If you don’t see any, post your own call for shop shares! Many people wait until they have, say, 200 followers, to have a sale. Before that, you’ll want to advertise via shop shares with a preview shot of what you’ll have and the date and time you’re posting. I use apps like A Beautiful Mess and Frametastic to create my images with text. If you have customers who requested a tag, you simply tag them in a post when you start the sale, usually in the comments. I use my iPhone, and I shoot items on my white kitchen table for a clean, simple background. Make sure your lighting is good. Then describe the item: size, brand, condition and price (with or without shipping, just note it). For vintage items, include measurements because sizing is not the same as modern clothes (usually vintage runs smaller). If there is a flaw in the item, note it and post a photo of the flaw. If there are any details to highlight, such as a fabric pattern, post an extra photo of that. Include relevant hashtags so people searching for certain brands or styles can find you. You can also create your own hashtags to organize your store. 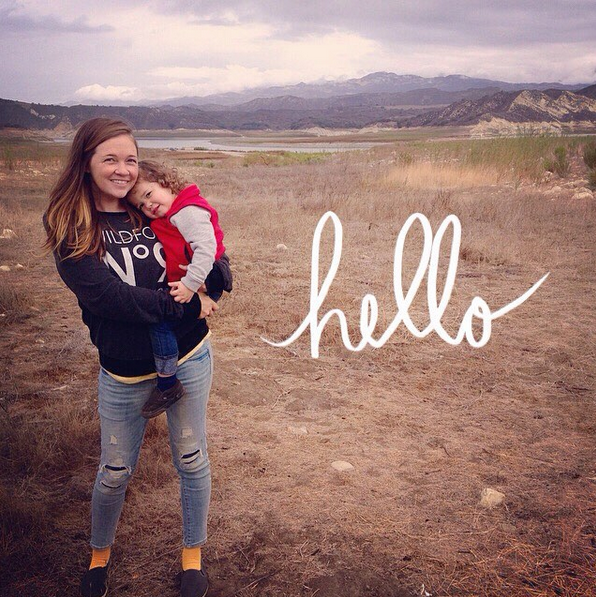 I use #amostownbaby #amostowntoddler and #amostownkids, for instance, then I also hashtag by specific size. The maximum number of hashtags allowed is 30, so take advantage. Once you’ve posted everything, check to see if anyone claimed anything (to me, five to 20 items makes for a good sale.). If they have, log into PayPal and create an invoice. Once it’s been paid, I delete the post so shoppers aren’t confused. It’s nice to keep your shop clean. I make a collage of sold items and post with the hashtag #amostownsold for reference. Most shops also do collages of sold items so shoppers can see what types of items they’ve had in the past or simply to keep track of sales.